Native American and Muslim women are headed to Congress for the first time, as candidates of color notched a series of historic wins in Tuesday’s midterm elections. Democrat Sharice Davids of Kansas became the first Native American woman elected to the House, beating incumbent Rep. Kevin Yoder in the district that includes part of Kansas City, Kan. Debra Haaland, another Native American, also won her seat in New Mexico’s solidly Democratic 1st District. Haaland will replace Rep. Michelle Lujan Grisham, who was elected New Mexico’s first Democratic Latina governor. Rashid Tlaib, a former Michigan state representative and a Muslim, cruised to victory in her race to represent parts of Detroit and its suburbs. Fellow Muslim Ilhan Omar, Minnesota’s first Somali-American legislator, became the first woman of color from the state elected to Congress. The congresswoman-elect led a surge of minorities running for office. The candidates of color reflected a growing sentiment among voters that it’s time for racial minorities and women to play a larger role in American politics. Almost 80% of voters said it’s very or somewhat important that more women and racial minorities be elected to public office and almost half said it’s very important, CNN exit polls showed. Around two-thirds of white voters said it’s important to elect more minorities, while around 80% of African Americans agreed. 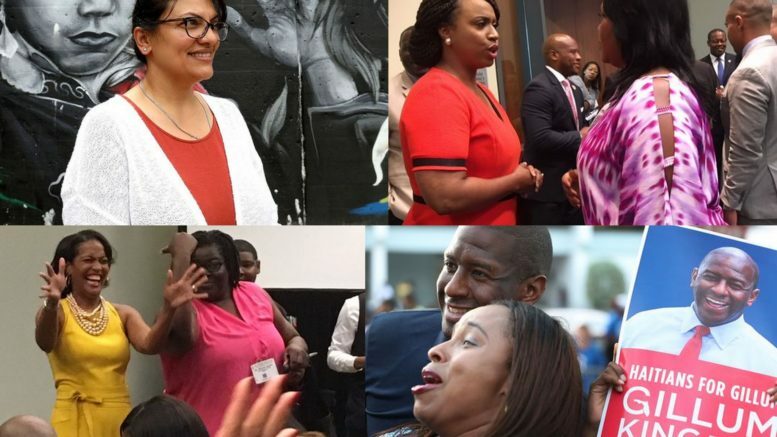 The diverse field of minority candidates that ran in this election cycle, mostly Democrats and many women, included Georgia gubernatorial candidate Stacey Abrams and Florida governor’s candidate Andrew Gillum. Abrams is trying to become the first black woman elected governor in America – a race has come down to absentee and provisional ballots outstanding early Wednesday. Gillum fell short in his bid to become the Sunshine State’s first African-American governor. Meanwhile, Massachusetts’ Ayanna Pressley became the commonwealth’s first black woman in Congress, and Connecticut’s Jahana Hayes earned the same distinction from her state. Pressley, who in 2009 became the first black woman elected to the Boston City Council, notched the first major victory of this election cycle among minority candidates. She shook up Massachusetts politics in September when she defeated 10-term U.S. Rep. Michael Capuano in the Democratic primary. She was running unopposed in Tuesday’s election. Hayes, a Waterbury schoolteacher, was the 2016 national teacher of the year. She was part of the record number of teachers who ran for office this fall, after this year’s demonstrations for higher pay and more respect. In Illinois’ 14th District, Democrat Lauren Underwood, 32, a registered nurse and former Health and Human Services Administration official in the Obama administration, unseated incumbent Rep. Randy Hultgren. Underwood became the first African-American elected to a district that is about 80 percent white. Republicans have held the seat for all but two of the last 69 years. In her victory speech, Underwood paid homage to former Rep. Shirley Chisholm, who was the first black woman elected to Congress – 50 years and one day ago, Underwood said. In Texas, Democrats Veronica Escobar and Sylvia Garcia became the first Latinas to represent the state in the House. Be the first to comment on "First Native American, Muslim women elected to Congress amid minority wins"